The documentary WAYNE, celebrating the life and times of Wayne Gardner, has created a flurry of interest in just a few preview outings. It hits local film screens early September and critics have said already that a big part of the doco’s charm is that it brings the 1980s back into focus. So what’s the big attraction for this wacky decade of big hair, power rock ballads, monstrous shoulder pads and gaudy spandex? Eighties super heroes were an equally quirky mix. Computer geeks, rock stars and financial wolves. Eventually it all fell apart in the “recession we had to have”, to quote then-Treasurer Paul Keating. For sure, as one of the former Seventies longhairs who lived through the 1980s, it certainly seemed like a decade where anything could happen to anybody. And a shining example of that was the Wayne and Donna Gardner show. Teenage sweethearts who went from The ’Gong to Monaco via grand prix motorcycle racing, they lived out their lives in the public eye and in a very Eighties, flamboyant way. The doco captures this in pretty much its entirety. And not all of it is pretty. As far as motorcycle racing goes, the Eighties were light years away from the Seventies. Grand Prix racing went from a “man in a van with a rough plan” to cigarette sponsorship igniting a paddock invasion of lavish motor homes, mobile workshops and pop-up corporate gin palaces where the rich and famous hung out because it was a cool place to be. The motorcycles us mere mortals rode also morphed between the decades. Electronic ignition, anti-dive front suspension, floating disc brakes and monoshock rear suspension appeared on production motorcycles. Then there was the crazy turbocharging war involving Japan’s big four manufacturers. 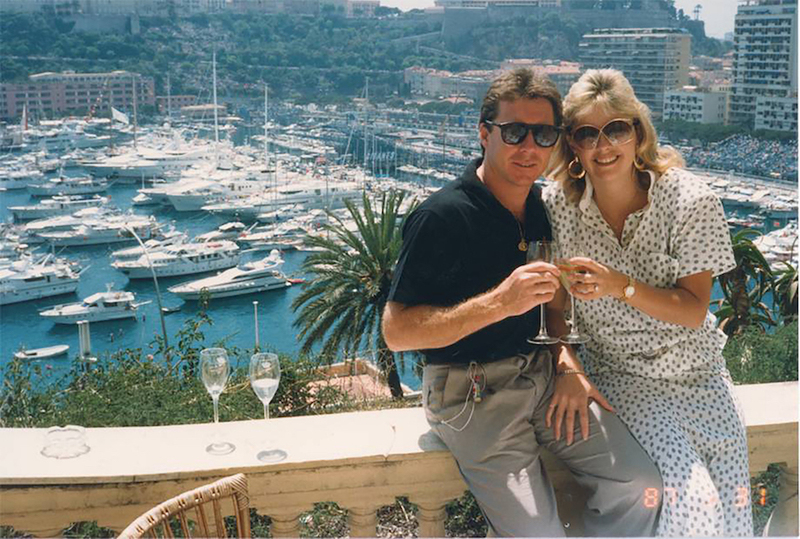 Wayne Gardner came to grand prix racing via Australia’s lucrative production racing scene. Just before he headed to the UK in 1981, a magazine feature described him as “the star of the skid kids”, an off-hand reference to his dirt-track background. Those formative teenage years would hold Gardner in good stead for what lay ahead in 500cc GP racing. His riding technique wasn’t that far removed from a rodeo cowboy on a bucking bronco. The Eighties 500cc GP scene was the era of light-switch two-stroke power delivery that no rider could tame. Gardner didn’t even try to finesse his way around. He rode his entire career on raw emotion. Nowhere was this more obvious than at Phillip Island in 1990. Nearing the end of his career, he beat new teammate Mick Doohan with half his fairing hanging off. Wayne’s 1987 world title, lived out on our TV screens via SBS, inspired some local movers and shakers to get involved with bringing a round of the world GP championship to Australia. On the few occasions the crowd didn’t motivate Gardner to win, he found other ways. One of the most classic was the night before a vital race when he locked himself in his motorhome and watched the movie Top Gun. Now you can’t get much more Eighties than that!